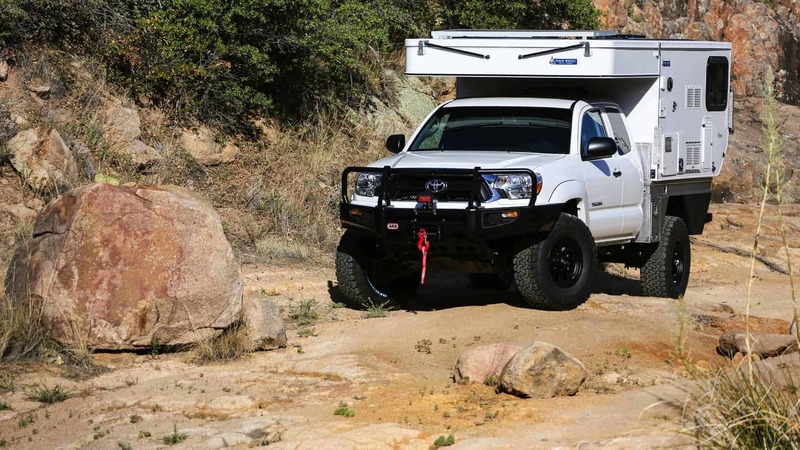 Sharing an office complex with AT Overland certainly has its perks, and watching the countless cool trucks roll through their shop is one of our favorites. 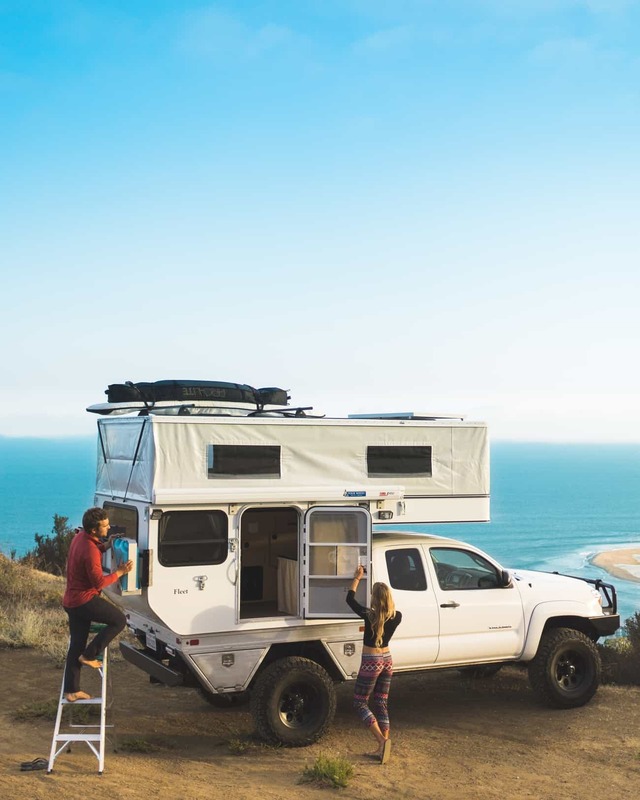 Most days we just drool from afar, but when they began to build a Tacoma for Kipp and Anne of Road Life Adventures we knew it needed to be shared. 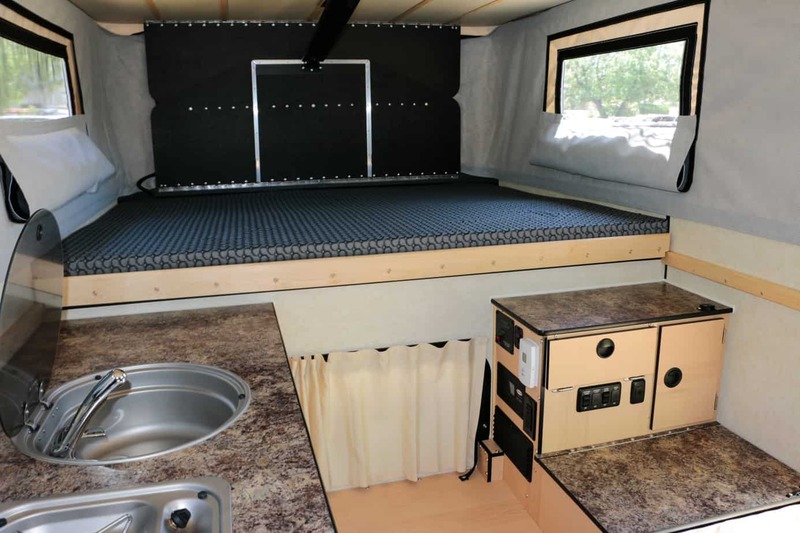 Designed to be a home for the duo while they travel to promote environmental stewardship and sustainable living, it features accessories that not only make it more capable, but surprisingly comfortable. 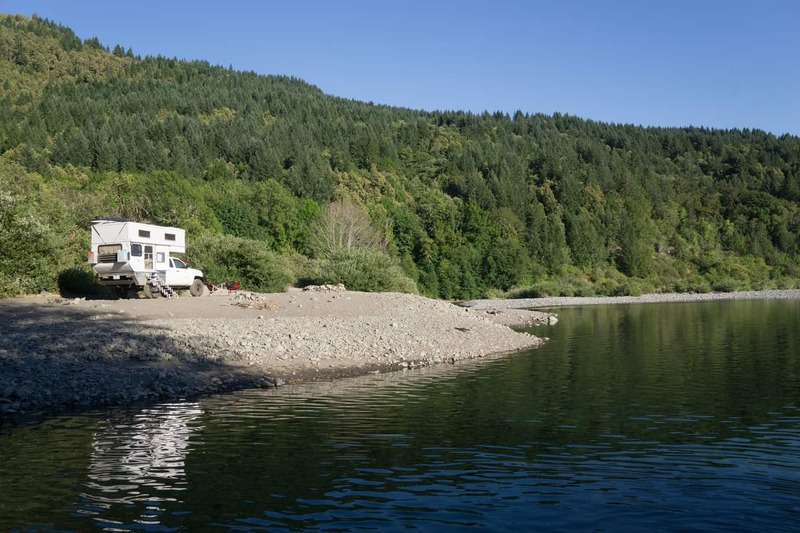 Good thing too, as they will need the rest with hobbies like rock climbing, surfing, kayaking, and hiking. 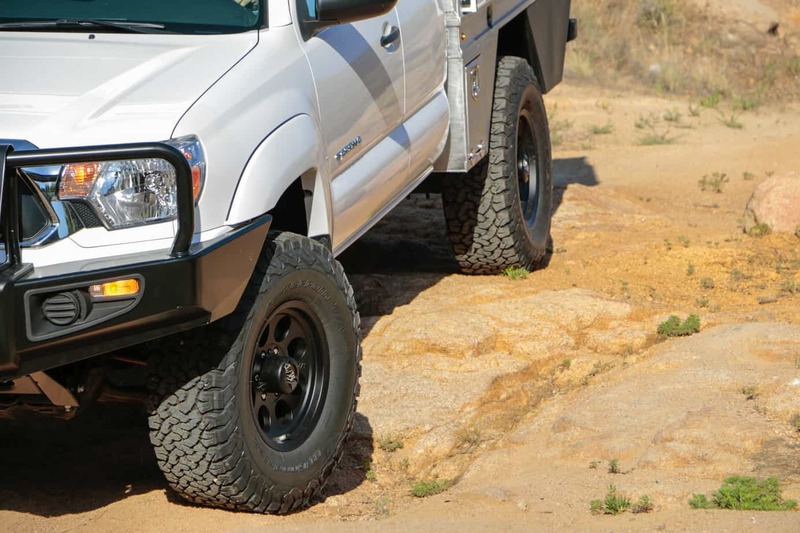 Starting with the basics, AT Overland installed a brand new set M/T Classic II wheels wrapped in BFG all terrain tires. 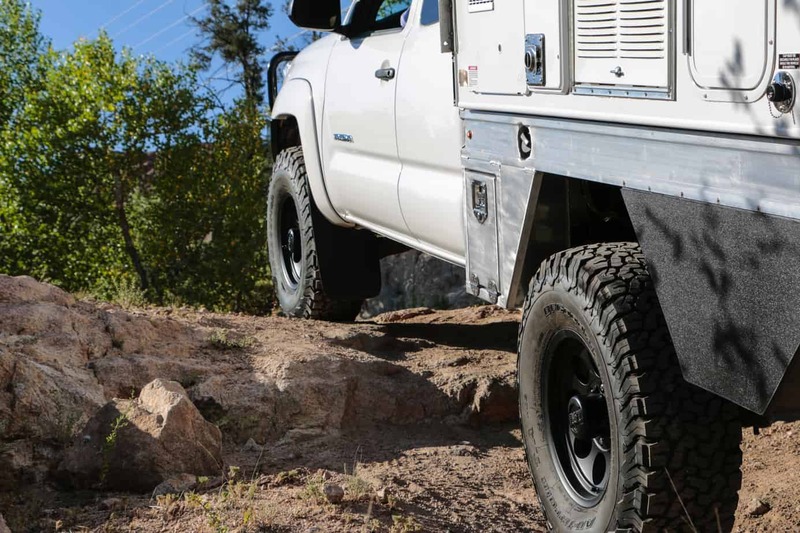 The upgraded tires not only improve reliability by reducing the chance of a flat, but also performance through improved traction in various terrains. 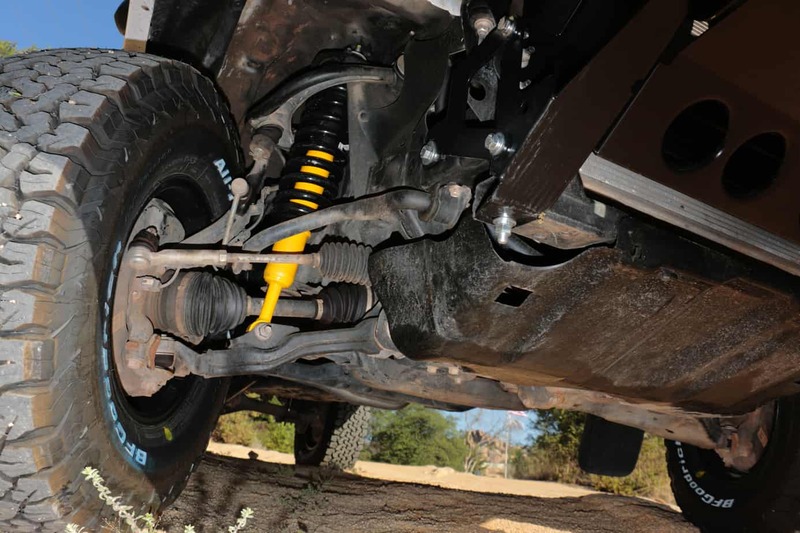 They then partnered the taller tires with a set of Old Man Emu shocks and springs to gain additional clearance for technical terrain. 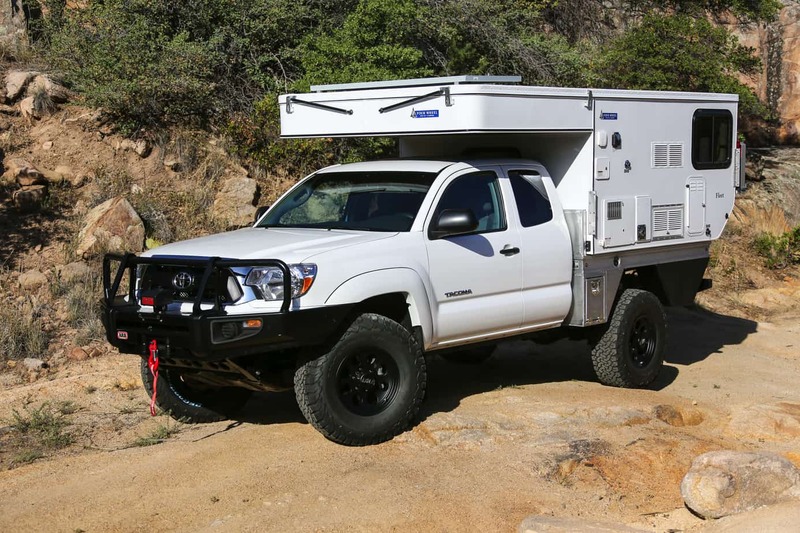 Of course this also has the benefit of managing the additional weight of the accessories and camper installed on the truck. 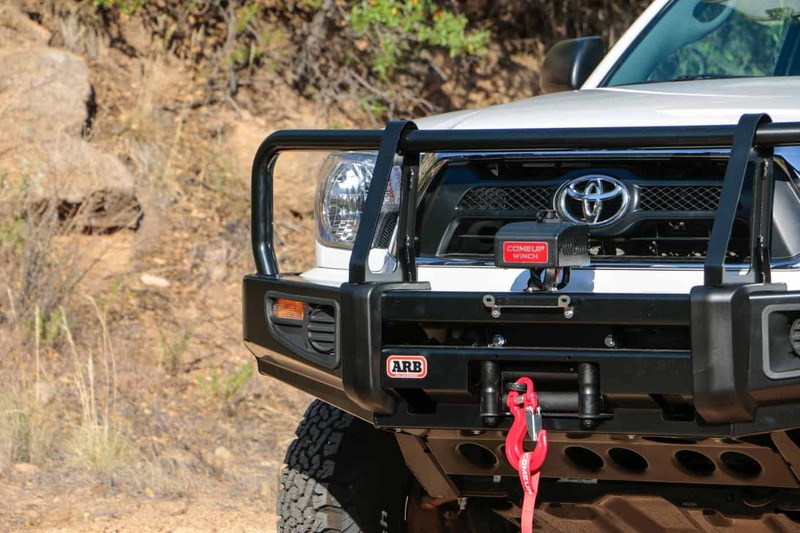 On the front end AT chose to install one of my favorite accessories, an ARB bull bar. 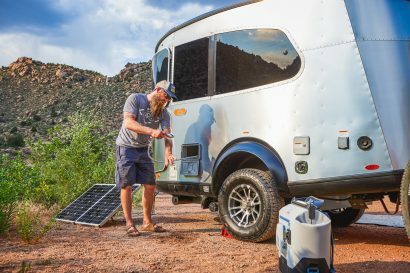 Yes we’ve all seen them a million times, but they are an invaluable addition to any true travel vehicle. 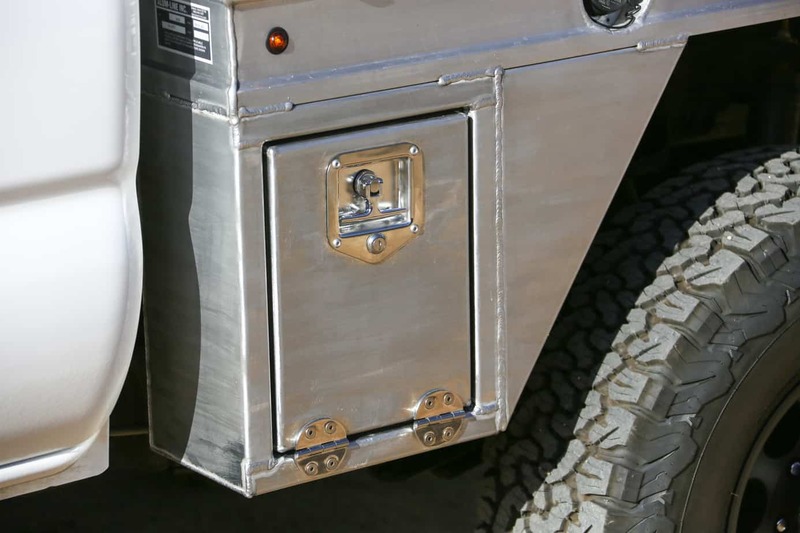 With airbag compliance and a proven ability to deflect impacts these bumpers are often the difference between life and death in accidents. 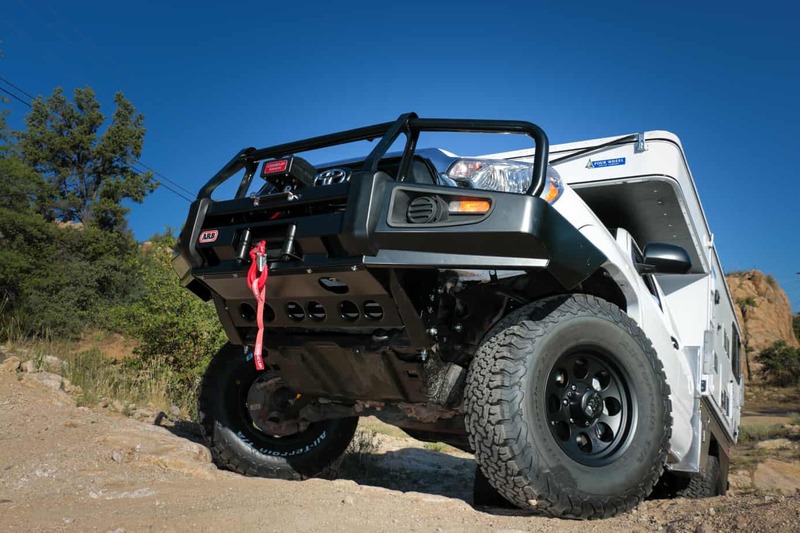 Of course it also promotes safety through recovery, and serves as a sturdy mounting location for the Comeup winch and black roller fair lead. 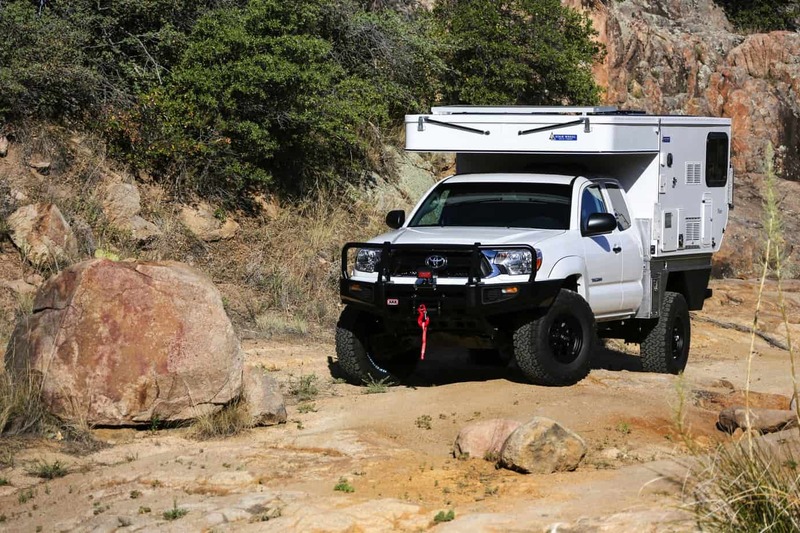 This stylish and effective combination will get this truck out of the worst stuck situations if used properly. 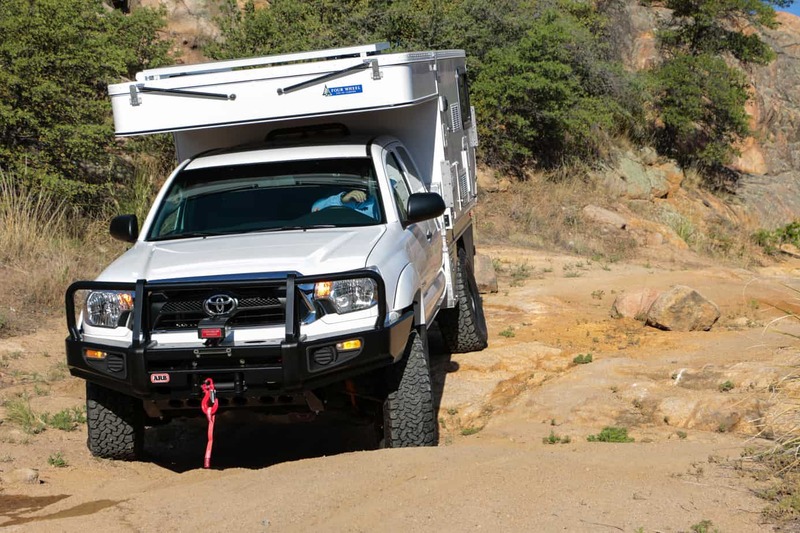 While the winch is a valuable asset, we often find that MaxTrax are our first plan of attack when stranded. 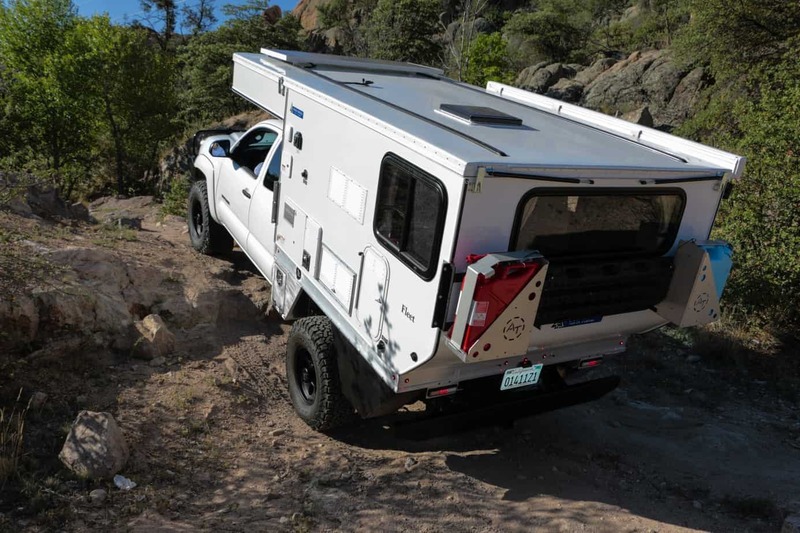 The back of this vehicle houses a set of four ladders as well as two fuel cans for extended range when re-fueling is not an option. 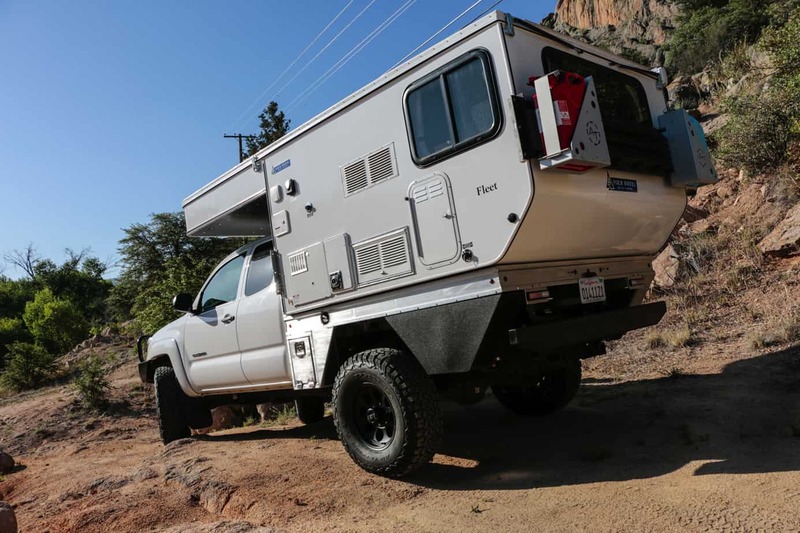 To prepare the truck for a Flat Bed camper and save on weight an aluminum bed was chosen instead of a traditional steel model. 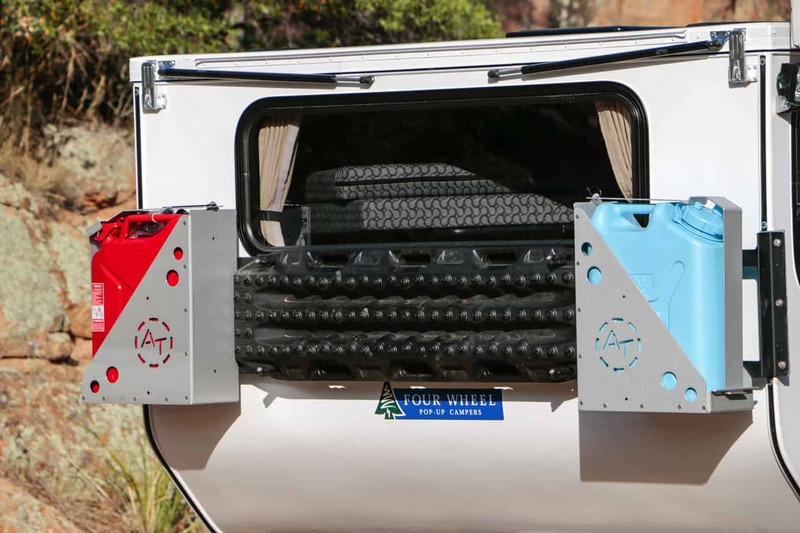 It features three matching cargo boxes with locking handles and a welded plastic 5 gallon grey water tank which together form the wheel wells. 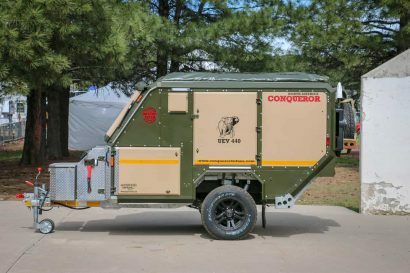 The final modification was the installation of the Four-Wheel Camper. 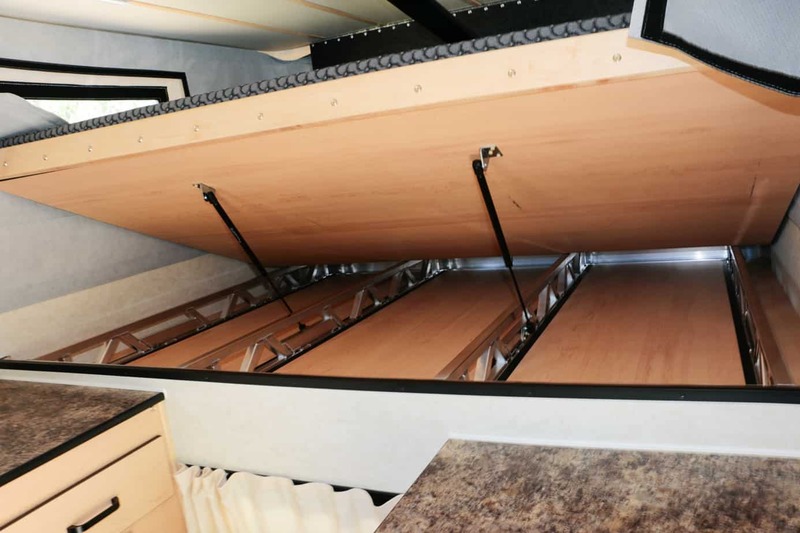 With no raised portions of the truck bed to eat up floor space we feel this flatbed model is one of the best options available in North America. 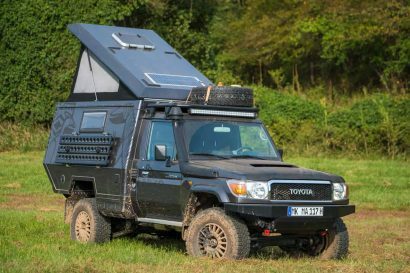 The ample head room allowed me, someone standing 6′ 4″, to walk around upright without issue, a difficult if not impossible task in most campers. 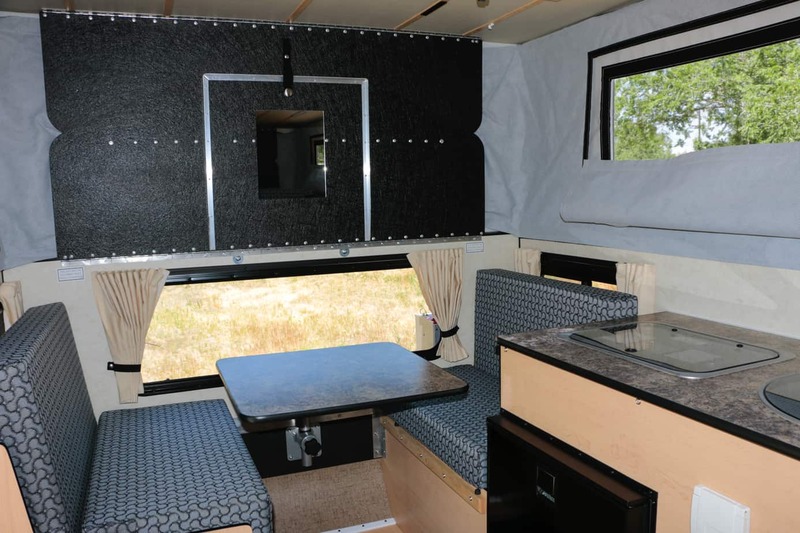 In the rear a large window lets in plenty of ambient light and offsets the dining nook perfectly. 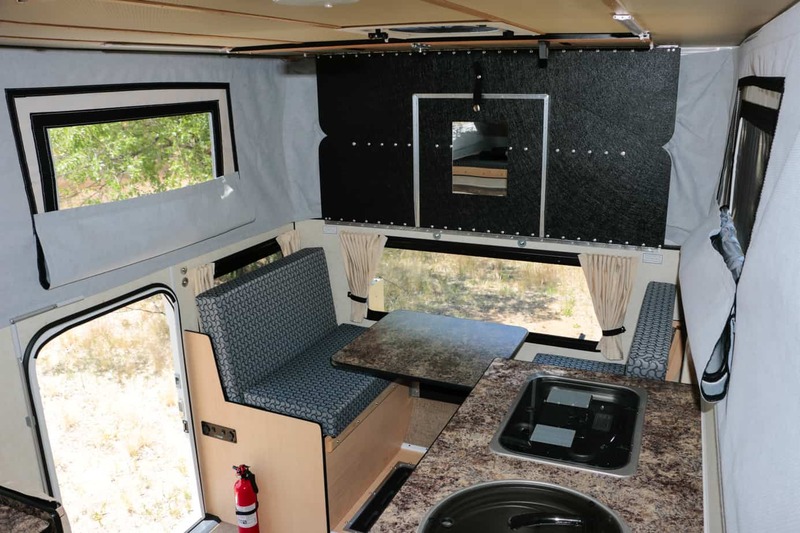 Whether working or relaxing, this is where you want to spend your time in foul conditions. 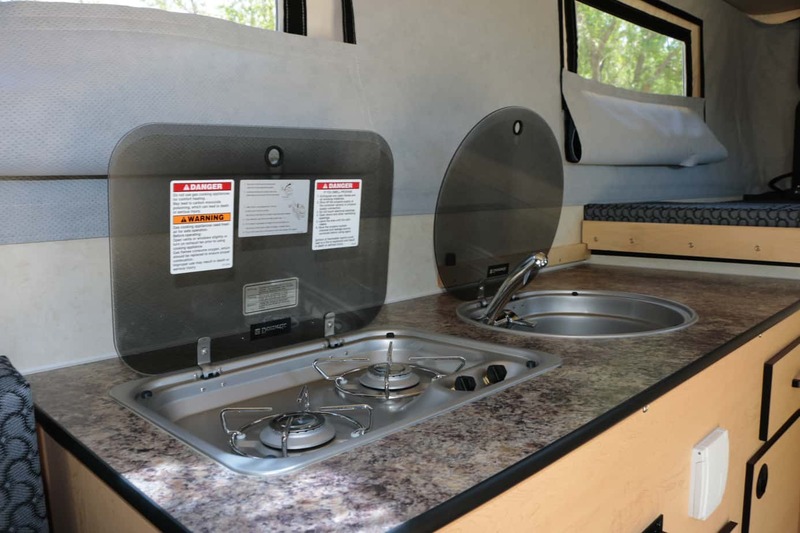 The kitchen comes well equipped with a two burner stove and a good sized sink and faucet. 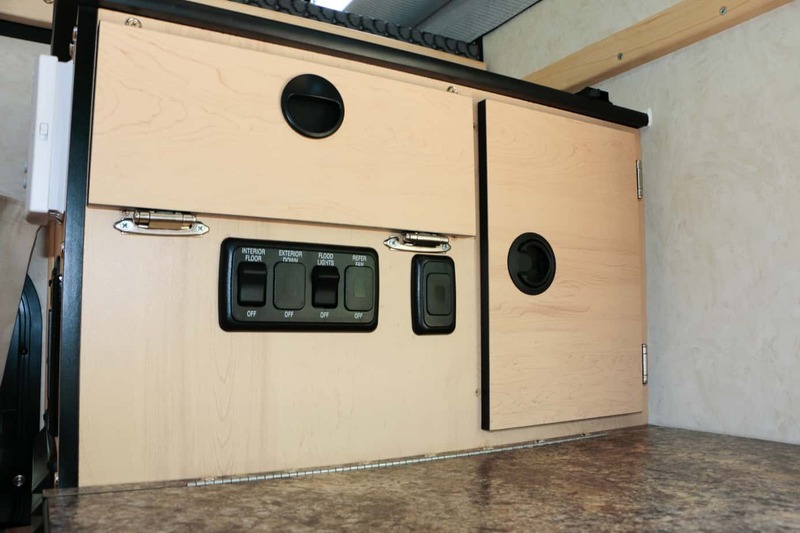 Both can fold flat with glass tops to allow use of the full counter for cooking, prep, or other projects. 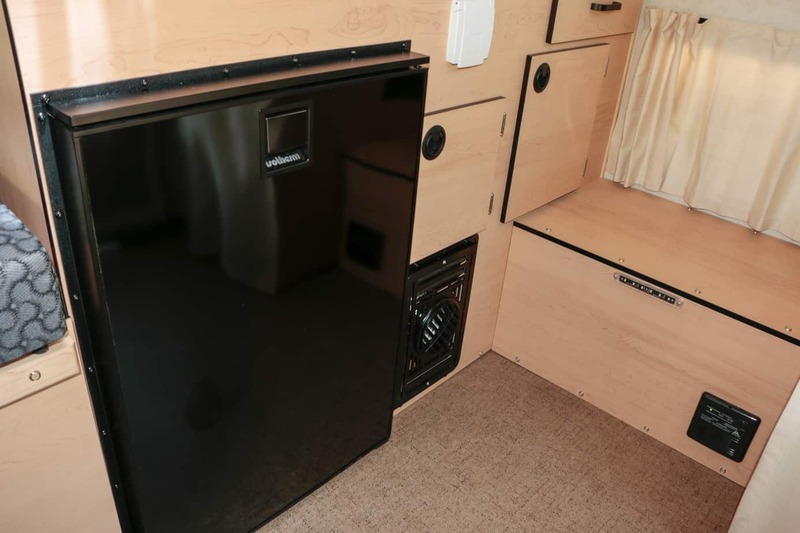 Underneath the counter the fridge has been neatly tucked into place next to more storage and the vent for the heater. 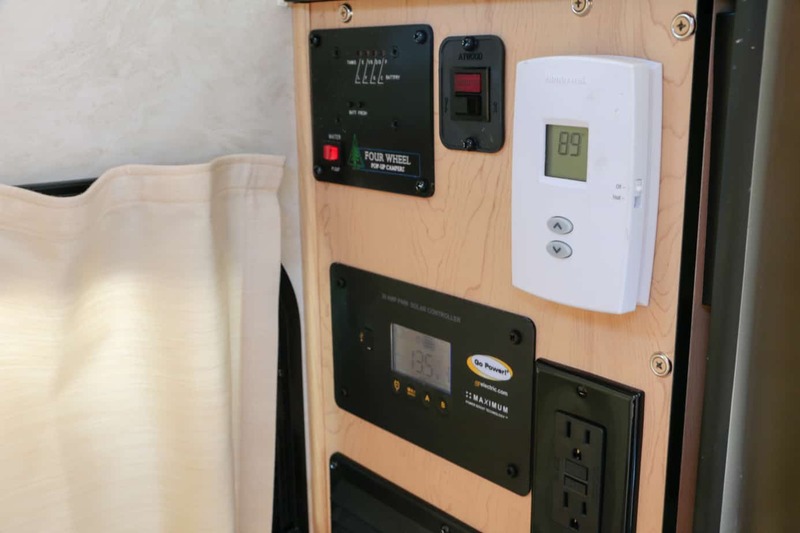 You’ll also find a queen sized bed with hidden storage beneath, a full electrical system with deep cycle batteries, and even a toilet with separate waste receptacle. 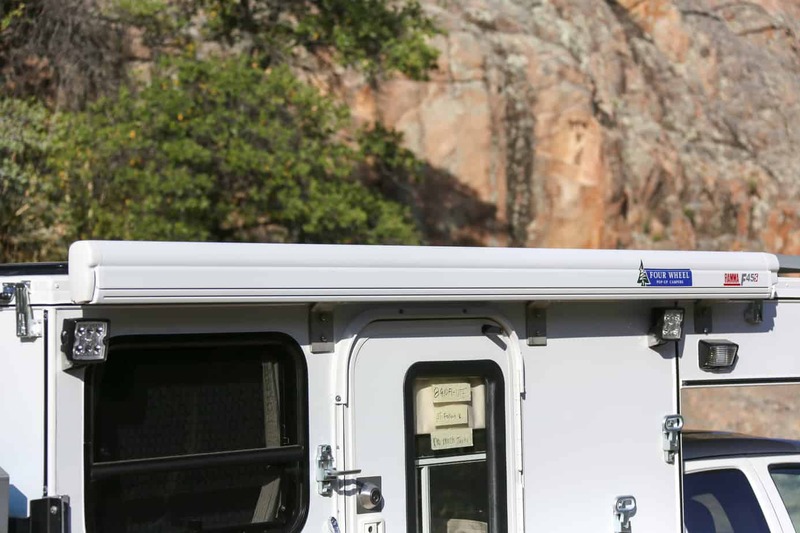 The pop-top is surrounded by fabric, but it is far from your standard tent material. 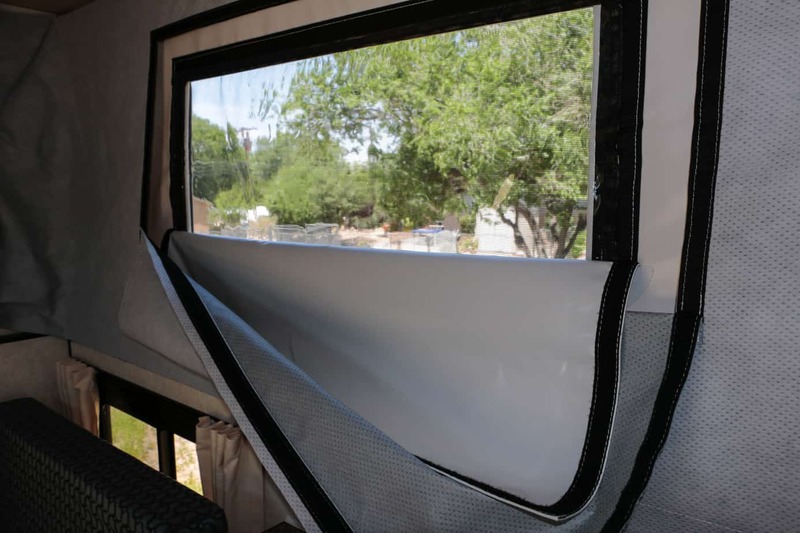 Multiple insulating layers are used to keep temperature and noise to a moderate level, and even the windows can be changed between mosquito mesh, clear plastic, or fully sealed. 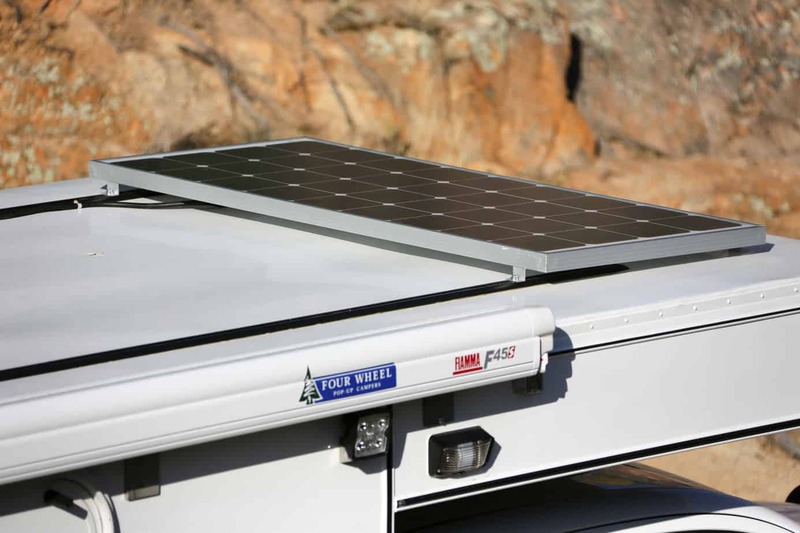 For long term electrical needs, AT installed a large solar panel on he roof of the camper, a sensible choice for the environmentally concerned traveler. 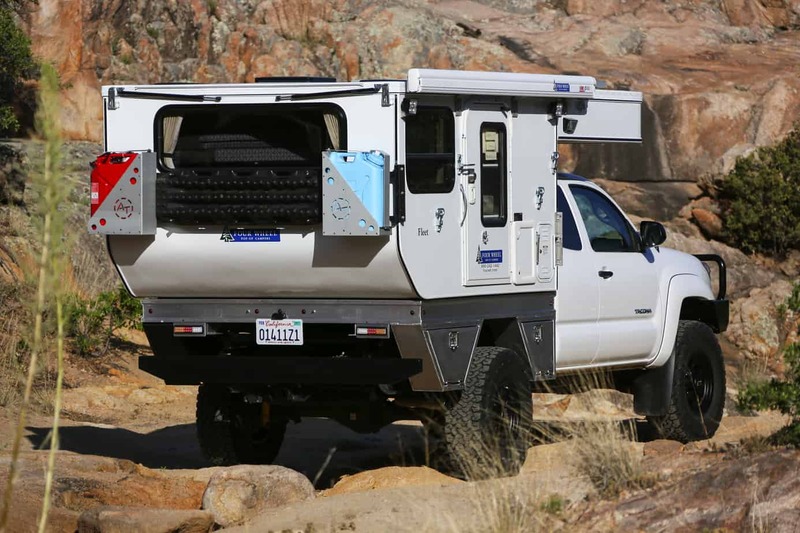 With good weather this unit can provide the truck with enough power to last indefinitely under normal consumption. 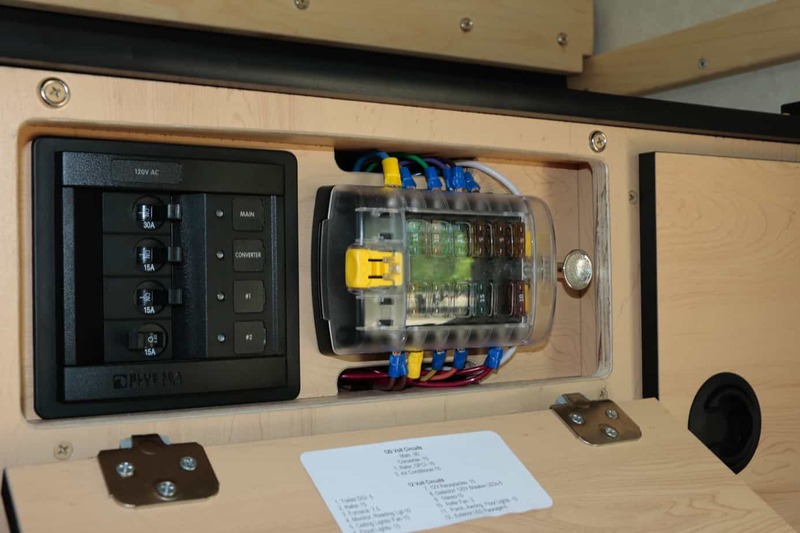 To store all this charge a custom twin 6-volt battery bank was added, providing up to 225 aH of storage on the go. 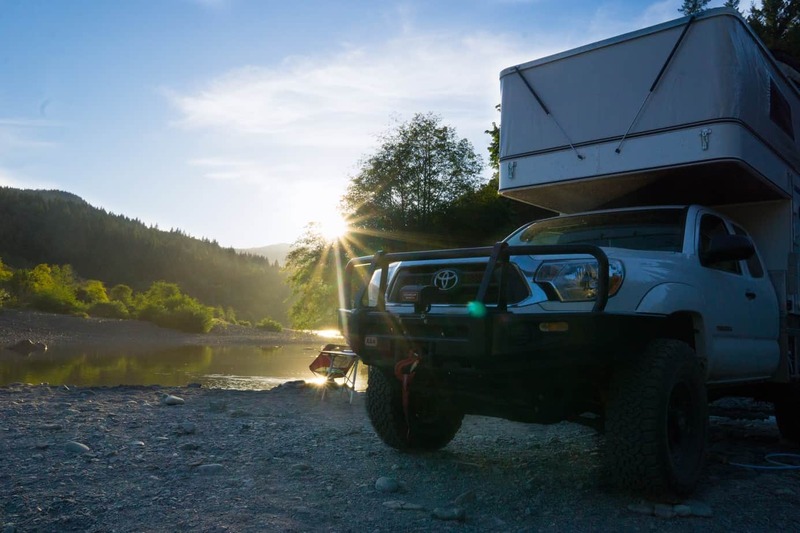 With just a few weeks on the road in their Tacoma Kipp and Anne are just getting started on this new adventure, but their photos are already inspiring myself and others. 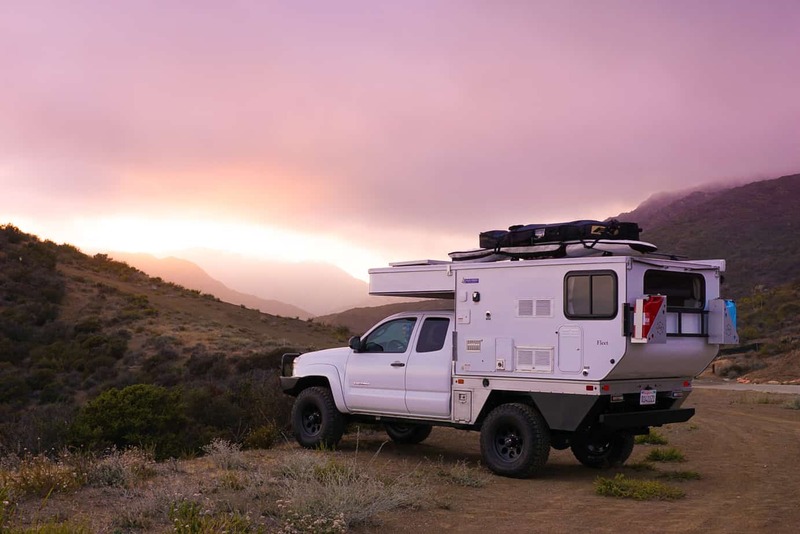 To watch these two travel the US or learn more about them, the truck, or their cause follow them on Instagram here.